Taking Genre Fiction and New Pulp to another level, Pro Se Productions, an innovative Publisher of Genre Fiction and New Pulp announces the release of the second issue of noted author Van Plexico’s Pro Se Single Shot Signature Series. 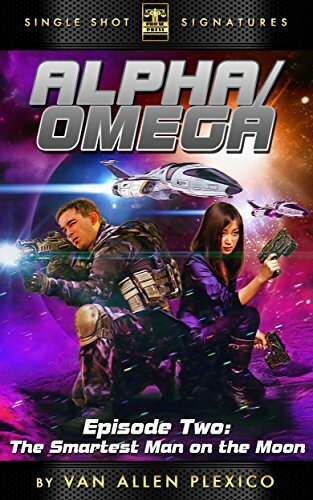 Taking his love for space opera and military science fiction to the page, Plexico’s Alpha/Omega Book Two: The Smartest Man on the Moon is now available for only 99 cents as a digital single. Secret tunnels and passages twist and turn across the moon as betrayal, political intrigue, and hushed whispers ripple through the people on Amphion, threatening stability and even their very lives. ALPHA/OMEGA: EPISODE TWO: The Smartest Man on the Moon –Who is it? And does he hold the solution to the problems facing Amphion and its residents…or is he the cause? Alpha/Omega Book Two: The Smartest Man on the Moon features fantastic cover art and logo design by Jeff Hayes and eBook formatting by Russ Anderson. The second episode is available for the Kindle via Amazon at http://tinyurl.com/n4zwn7r and for most eBook formats via Smashwords at http://tinyurl.com/nd4yhsg for only 99 cents. NOTED AUTHOR JOSHUA REYNOLDS ENTERS PRO SE SINGLE SHOT SIGNATURE LINE WITH 'WEIRD HEROES'!